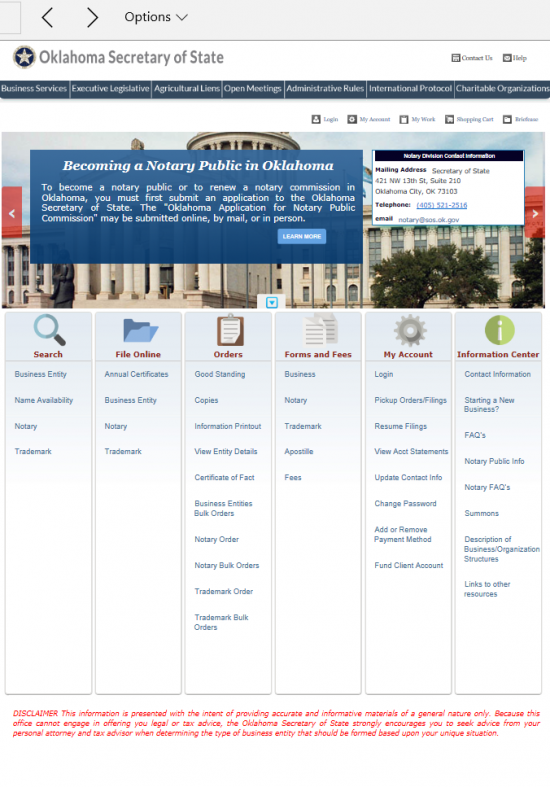 The Oklahoma Certificate of Qualification is provided by the Oklahoma Secretary of State. Both profit and nonprofit foreign corporations must use Oklahoma Secretary of State forms to apply for the Certificate of Qualification. This information must be submitted for approval to the Oklahoma Secretary of State in order to transact business in this state. It should be mentioned that some corporation types may have to submit additional information to remain in compliance with Oklahoma State requirements for registering a foreign corporation. All corporations will need to submit a Certificate of Good Standing issued by the domicile state within sixty days of the filing date. The Filing Fee must be calculated and is one tenth of one percent of the total authorized capital for this corporation. The minimum that may be paid is $300.00. That is, nonprofit corporations and profit corporations with a TAC less than $30,000 or with less than 30,000 shares will need to submit this fee with this application. 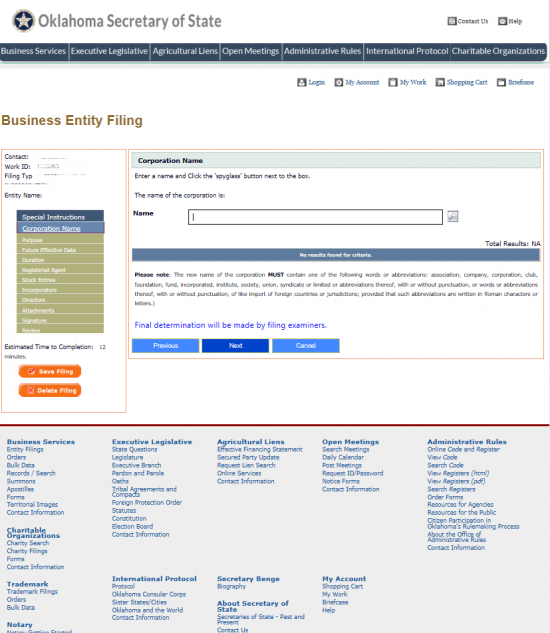 Profit corporations who do not fit into this category will need to calculate the Filing Fee. The Filing Fee must be paid when submitting the Certificate of Qualification. It may be paid with a check made out to Secretary of State (if filing by mail) or by credit card (if filing electronically). Step 2 - In Item 1, report the Name of the corporation. Note: If the name is not available in the State of Oklahoma then a Fictitious Name Report must be filed or a resolution drawn up by the corporation stating the adoption of a fictitious name for use in Oklahoma. Step 3 - In Item 2, document the domicile jurisdiction of the filing entity. Step 4 - Report the Principal Office or Principal Place of Business Address on the space provided. Step 5 - Item 4 will name the Oklahoma Secretary of State as the Registered Agent while Item 5 must contain the Full Name and Full Address of the Registered Agent obtained by the foreign corporation in the State of Oklahoma. 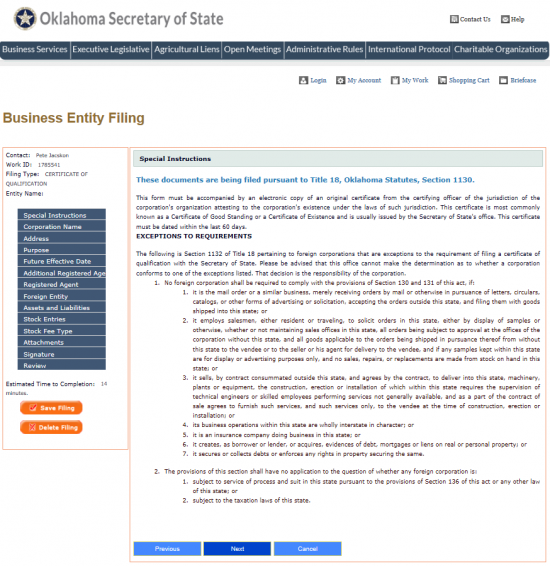 Step 6 - Document the Purpose this corporation has for operating as a corporation in Oklahoma in the space provided in Item 6. 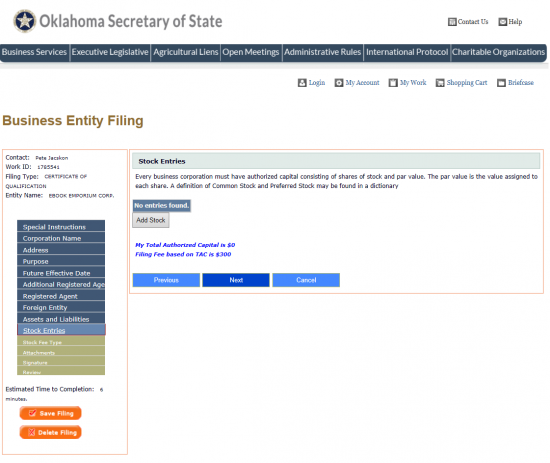 Step 7 - Item 7 will bind the filing entity to the business named in the parent state. 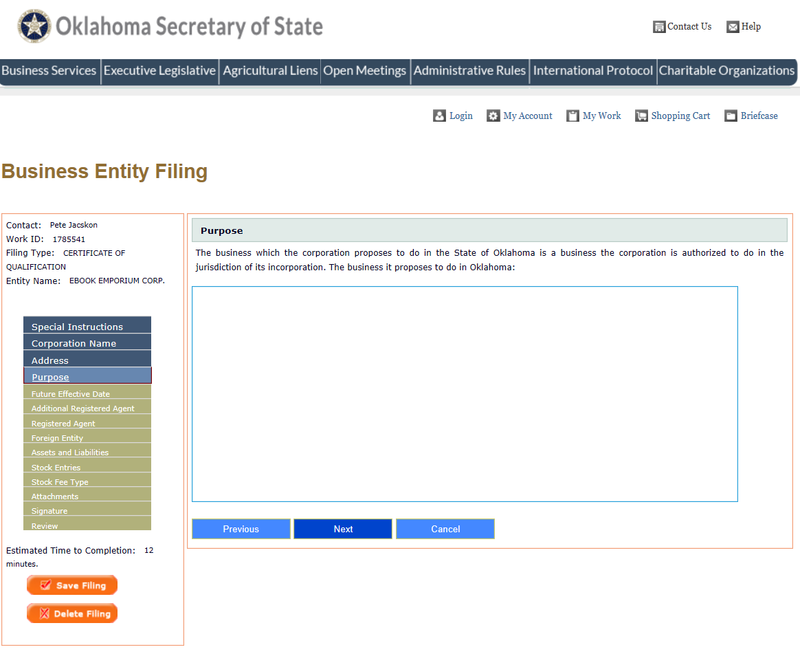 Step 8 - In Item 8 report the assets of the corporation on the first blank line and the liabilities on the second blank line. This status must be the case within six months prior to filing. Step 9 - Item 9 will seek to define whether the filing entity is a corporation for Profit or Not for Profit. If this is a profit corporation then place a check mark in the first box. If this is a nonprofit then place a check mark in the second box. Step 10 - Item 10 will require attention if this is a For Profit corporation. If so you must report each Class of stock, the Number of Shares in each class, the Series (if applicable), and the Par Value Per Share (if there is none you must state this). Do this in the labeled spaces provided. 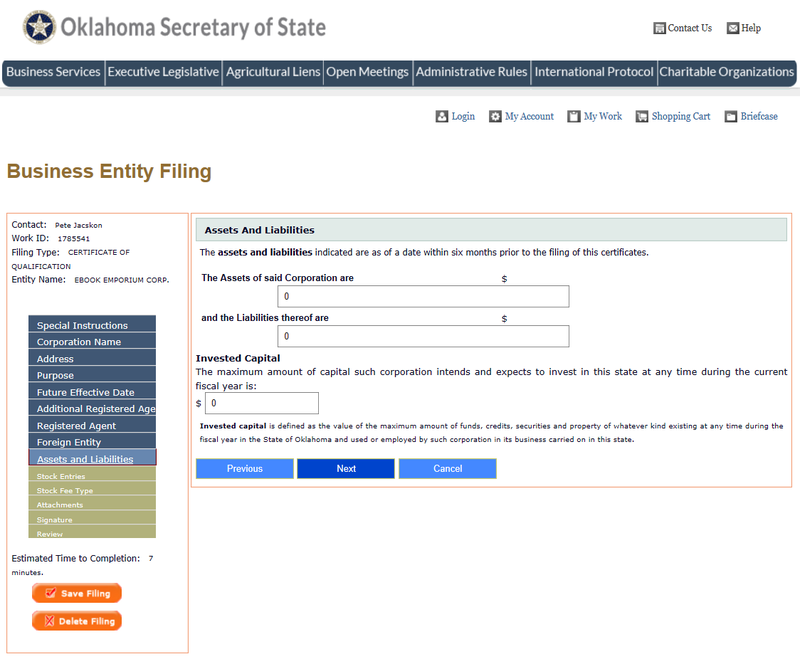 Step 11 - In Item 11, give an estimate on the Maximum Amount of Capital the foreign entity expects to invest in this state during the Fiscal Year in the space provided. 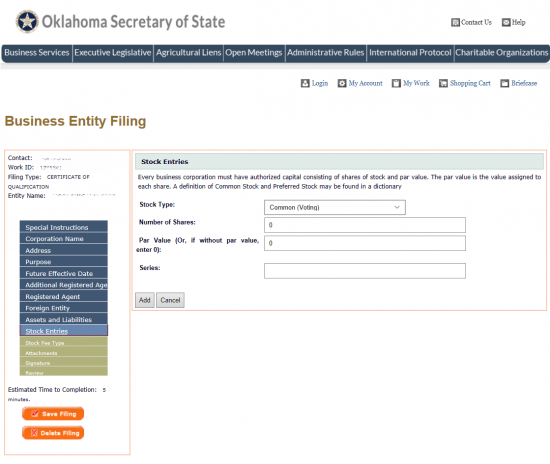 Step 12 - On the blank line in Item 12, provide a valid up to date Email Address where the filing entity may be reached. Step 13 - At the end of this document locate the statement beginning with the word “Signed this” then enter the calendar date of the month this document is being signed on the first blank line. Then on the next two blank lines, report the Month and Year of the signing. 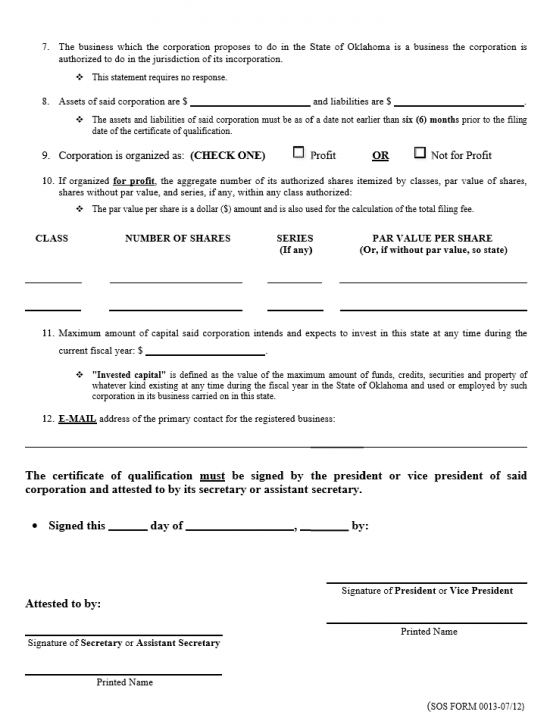 Step 14 - At the bottom right the President or Vice President must Sign this Certificate of Qualification then print his/her Name. 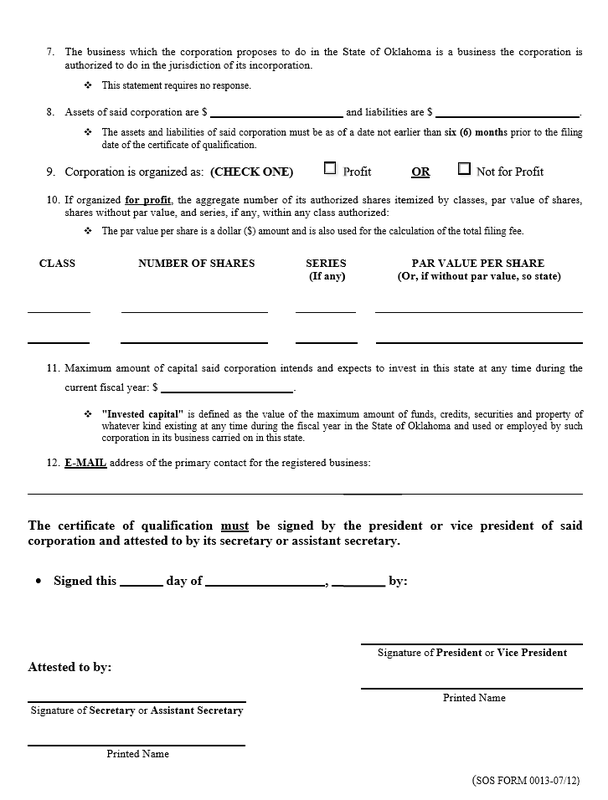 Below this, on the left, the Secretary or Assistant Secretary must Sign and Print his/her Name to attest to the President or Vice President Signature’s authenticity. Step 15 - Next, attach the Certificate of Good Standing (or Certificate of Existence) issued by the parent state within the past sixty days. Step 16 - If this is a profit corporation you must calculate your fee as one tenth of one percent of the Total Authorized Capital. If the TAC is less than $300,000.00 then the Filing Fee is $300.00. If it is greater than $300,000.00 then the Fee will be $1.00 for every $1,000 plus the base $300.00. 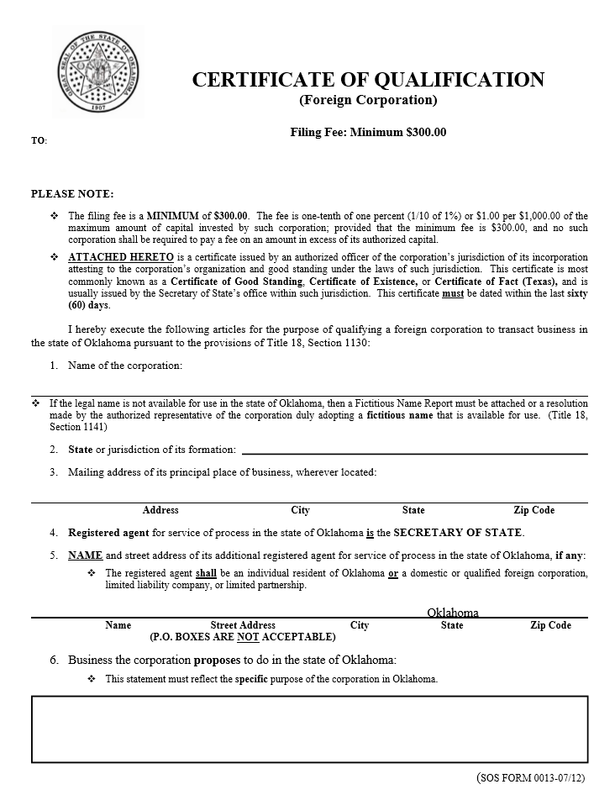 The Filing Fee for foreign nonprofit corporations is $300.00. 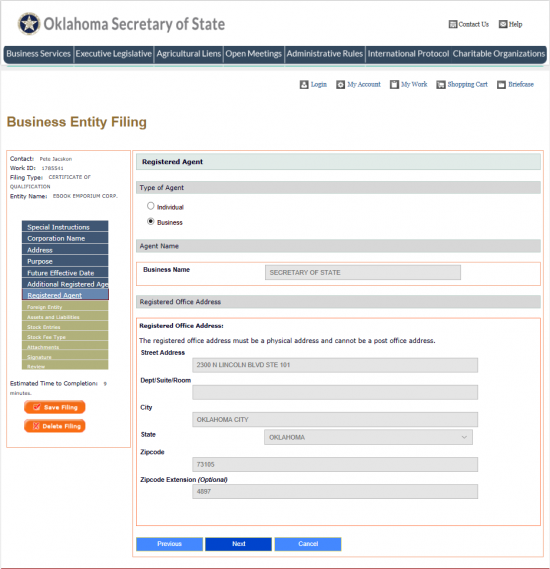 The Filing Fee must be paid in full with a check made out to Secretary of State. Step 17 - Double check the Oklahoma Certificate of Qualification you have filled out and make sure all necessary documents are attached with a check for the full amount of the applicable Filing Fee (payable to Secretary of State). 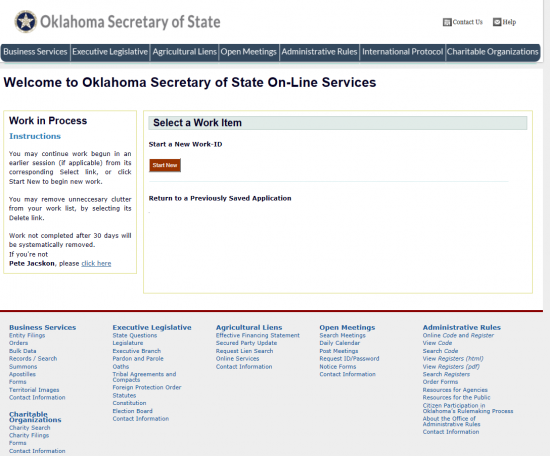 Then submit to the Oklahoma Secretary of State by mail. Step 2 - Under the heading “File Online,” select the “Business Entity” link. 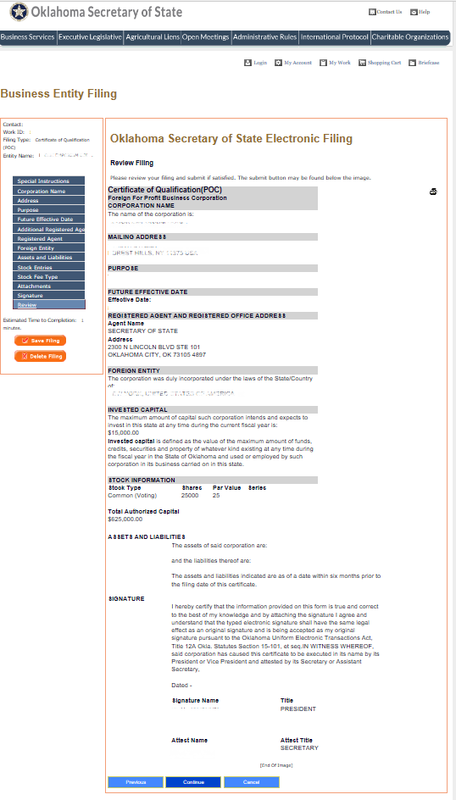 Step 4 - Provided you have set up an ID, you will be directed to the first page of this form. 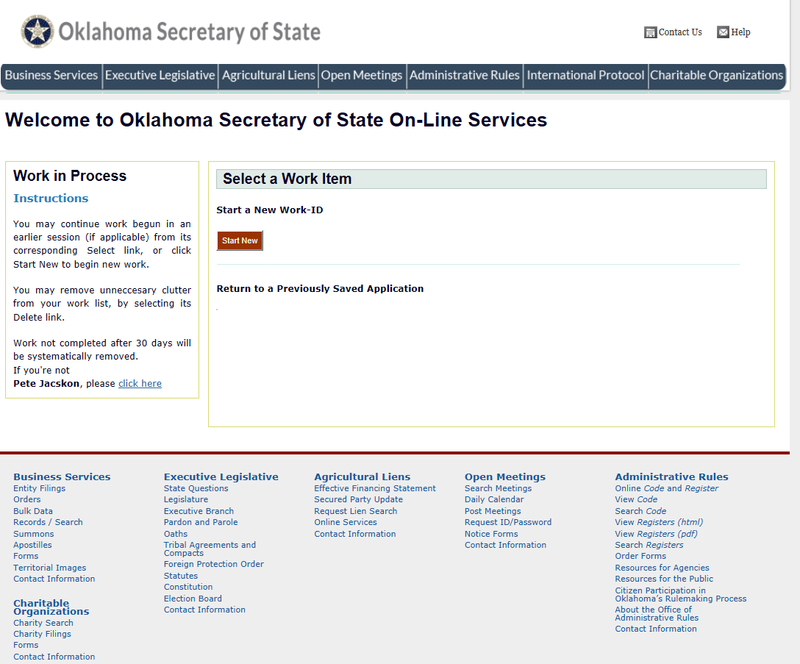 In the Select Work Item section, click on the “Start New” button. Step 5 - Read all the information on the Special Instructions page then select the “Next” button. 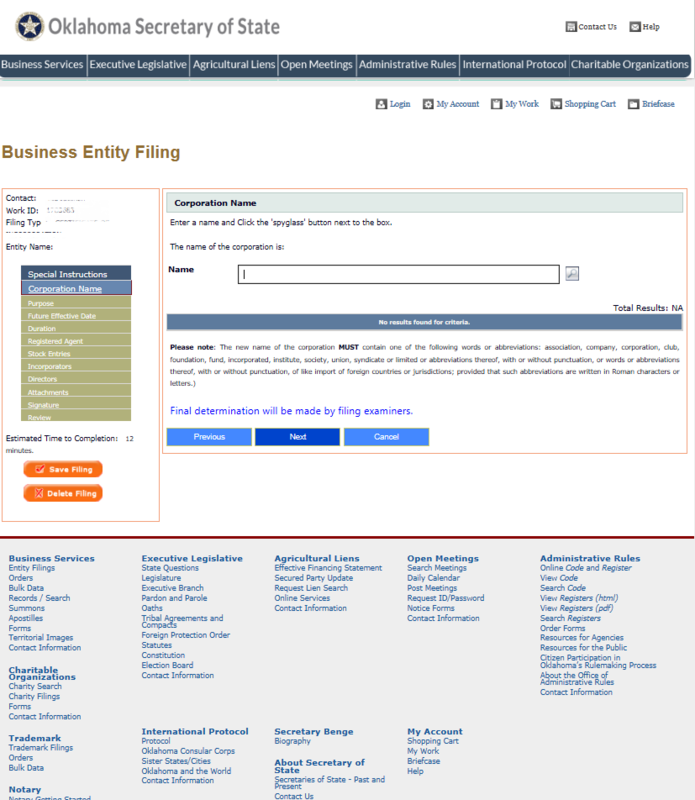 Step 6 - The Corporation Name page will require you to perform a search for the corporate Name being used. Enter the Full Name of the corporation in the “Name” section, then select the Spy Glass Icon on the right of the text field. If it is available select the “Next” button. 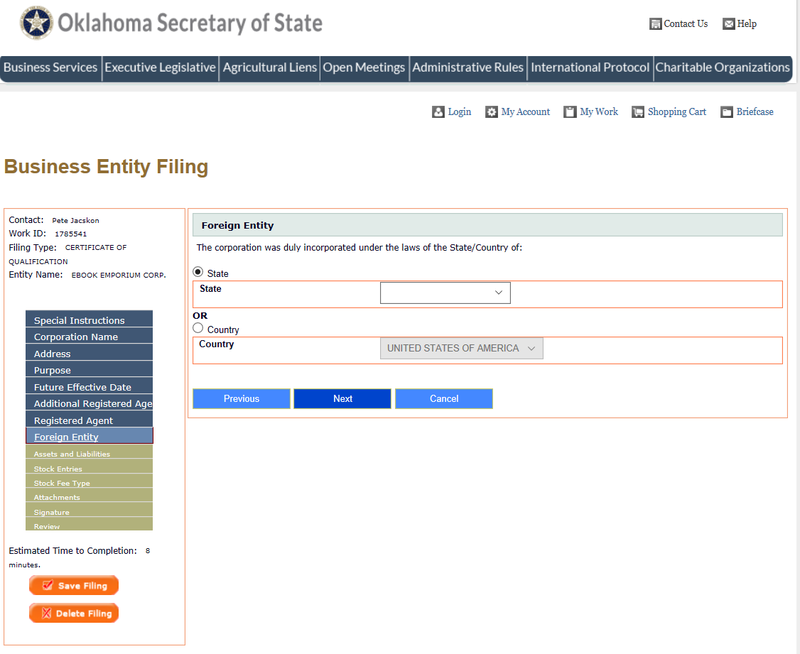 Step 8 - Enter the Purpose of the foreign corporation operating in the State of Oklahoma in the text box provided. Once you have done this, select the “Next” button. Step 9 - On the Future Effective Date page there will be two radio buttons to choose from to define when the Certificate of Authority should be active. 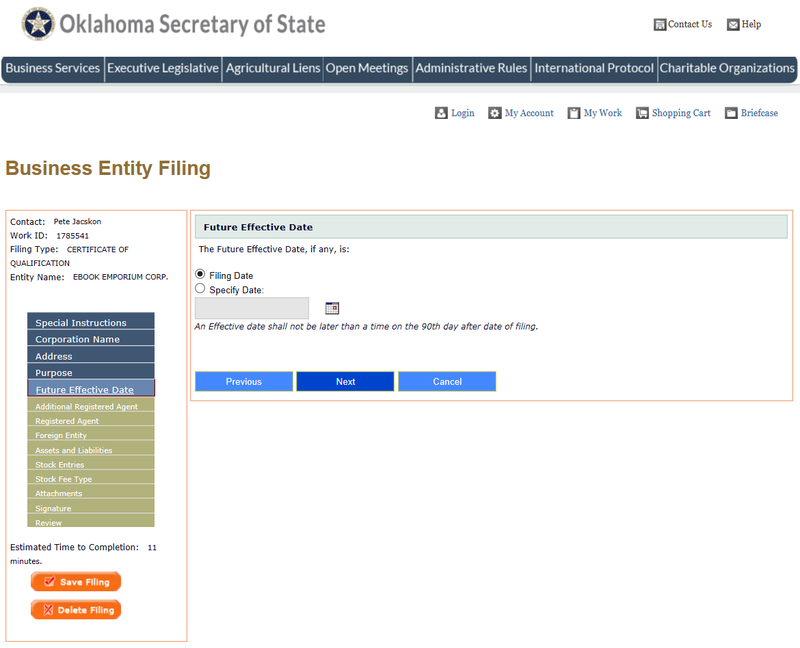 If you wish the Effective Date to be immediate upon Filing successfully then select the first radio labeled “Filing Date.” If you wish the Effective Date to be different you may select the second radio button then, in the text field, enter the Effective Date (must be within the 90 days of Filing Date). Once you are done select the “Next” button. 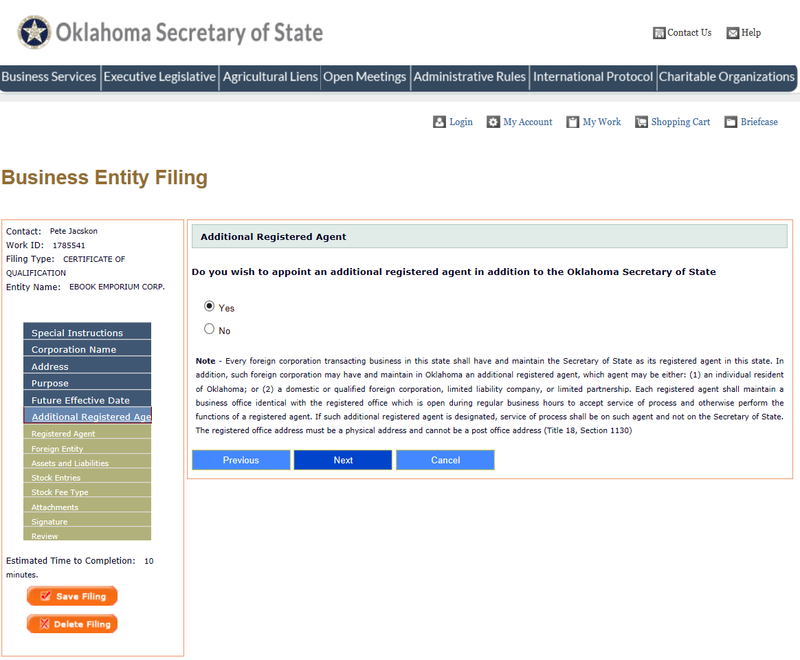 Step 11 - The Next Page will display the Registered Agent information for the Oklahoma Secretary of State. Select “Next” if you wish to use the Oklahoma Secretary of State as your only Registered Agent. Step 12 - The next page will require you to define the Jurisdiction where this entity is incorporated. You may choose one radio button “State” or “Country.” Next to each radio button is a drop down list with the appropriate choices. You must choose one of these radio buttons then use the corresponding drop down lists to select the jurisdiction. 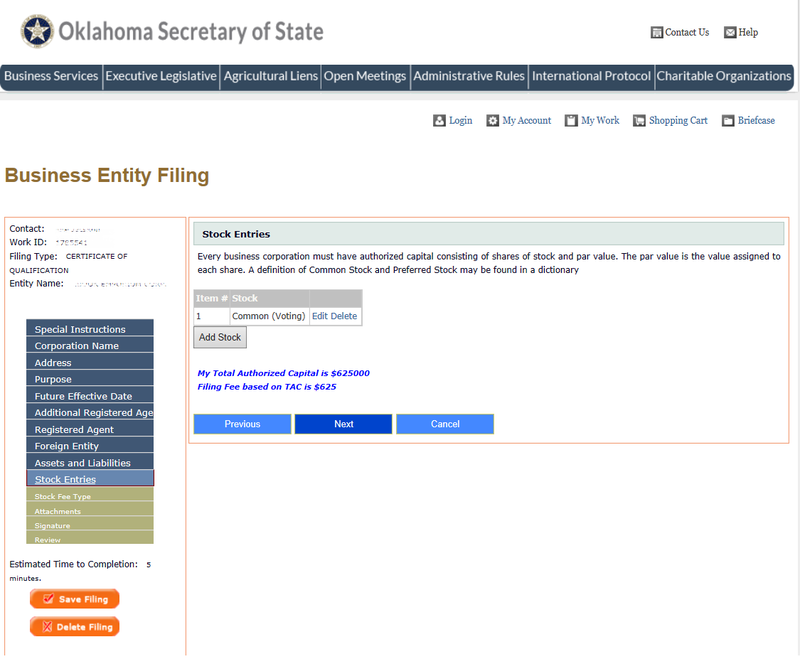 Step 13 - The Assets and Liabilities page will require the total dollar value of the assets/property in the first field, the total dollar value for the corporation’s liabilities in the second field, then the total dollar amount of investments the foreign corporation intends to invest in the State of Oklahoma. 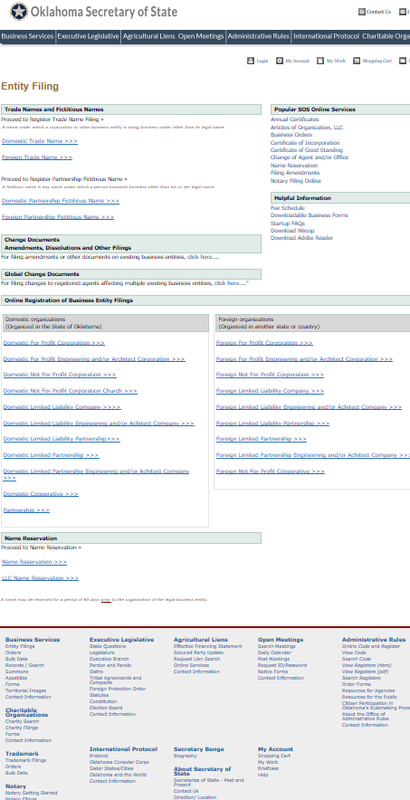 Step 14 - On the next page, you will need to define the stock information of this corporation. 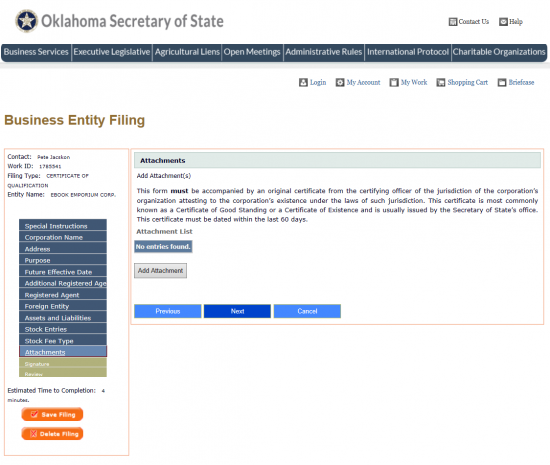 This will determine the Filing Fee for this certificate. Select the button labeled “Add Stock” to be guided to the information where you may enter the appropriate information. Step 15 - In the field labeled “Stock Type,” select the appropriate stock type from the drop down list. Step 16 - In the field labeled “Number of Shares,” enter the Total Number of Shares at this corporation’s disposal. Step 17 - In the field labeled “Par Value (Or, if without par value, enter 0),” report the Par Value for the Stock Type you have defined. Step 18 - If applicable, enter the Series in the last field. Once done, select the “Add” button. Step 19 - You may review the information you entered in the table on the screen. You may Edit or Delete each row using the links in the last field. You may also use the “Add Stock” button to enter more information. When you are ready, select the button “Next.” Notice the Filing Fee is defined below this table. Step 20 - The next page will give you the opportunity to add any attachments you wish. You must add a Certificate of Good Standing issued by the foreign corporations Secretary of State or an equivalent document from an equivalent governing body. Use the “Add Attachment” button to select the appropriate file from you computer then upload the document. Once you have done this, select the “Next” button. Step 22 - In the Attest section, the Secretary or Assistant Secretary must provide an Electronic Signature in the appropriate text field. 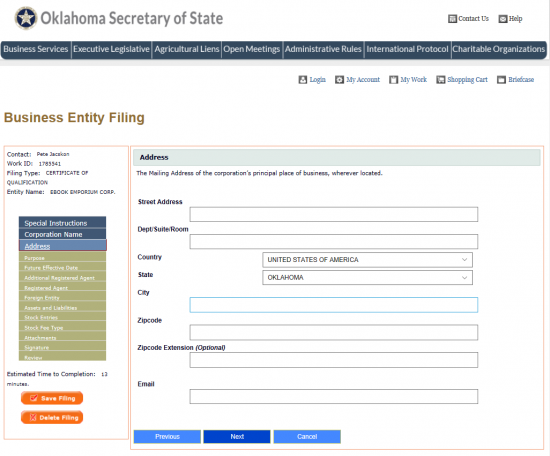 In the “Title” field, use the drop down list to indicate if this is the attestor signature is the Secretary or Assistant Secretary. Once this is done select the “Next” button. Step 23 - This page will have all the information that has been entered. Review this information carefully. If necessary use the section titles on the left to navigate to an area needing adjustments. When this is complete, select the “Continue” button at the bottom. This will guide you to the payment area where you may enter your credit card information for the Filing Fee noted in the Stock Information section.